2019 has just started and for the facility management industry, this is going to be a very exciting year. 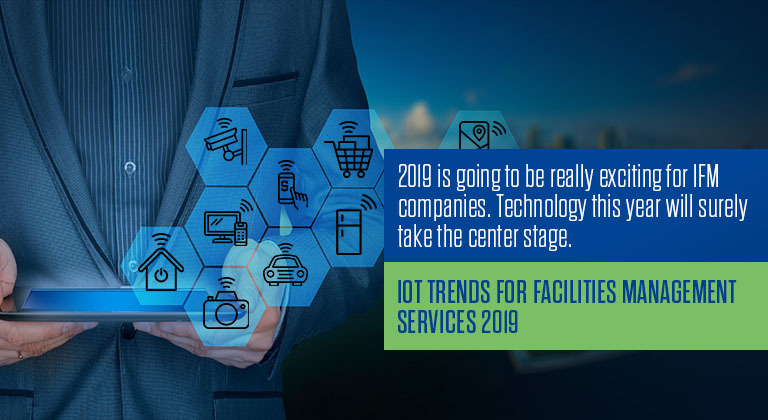 It would be safe to say that globally this will be the year of IoT and new devices which would make things way more efficient for facilities management companies. Not to mention it will also help them swell up their wallets a little bit. In the near future, say by 2020 35% of operation critical assets will be controlled by computers. Almost all the heating,cooling and lighting control will be depended upon cloud infrastructure for their upkeep and functioning. All these assets will also provide the facility management companies with real-time data which would enable managers to plan their things accordingly. This data in technical terms is called asset generated data. So what it means in simpler terms is that no manpower would be invested in actually going down to check the assets for themselves. The managers would know what needs to be repaired or replaced and when. The BMS phenomenon will triumph, by 2020 almost no professional facility management company will be able to do without a building management system. BMS will be the benchmark software platform that every facility manager would have to be comfortable with. The entire spectrum of properties that a facility management company manages will all be centrally controlled by BMS. This would take the efficiency of an IFM and housekeeping services company to the next level. They would know every square inch of their property without investing anything extra on manpower. Along with the facility management companies, the provider of software for this sector is bound to grow. Yes, their valuation will definitely increase by manifolds. It’s not just about the one-time software sale and installation but also about managing the data centers. Facility management companies are not IT pros and would need external help for managing data operations. Hence this is one arena which is bound to flourish. This is one trend which will surface this year. However, it would need a great deal of time to become mainstream yet.